Mellyn Miller graduated September 2016 from our Cosmetology 102 program in Poway, CA. This is her story. I began my journey back in March of 2015, graduated September 2016 and became licensed in October 2016. 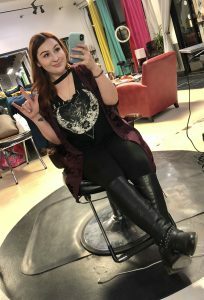 I have been doing booth rent at a cute local salon for about a year now and in this time have built a clientele for myself and able to stay consistently booked. It didn’t start out that easy though. I found myself in two separate salons that weren’t right for me. But I didn’t give up and kept on with my journey. You have to find the right place that works for you. Back during my time at Bellus Academy I tried to emerge myself in as much of everything as I could tried to soak in everything I was learning from my awesome educators. To name a few, Dorothy, Cassie, Melissa and Lora. Bellus Academy shaped me into the stylist I am today. In school, I spent time learning from mistakes and taking constructive criticism. Mistakes are scary but you have to remember to pick yourself back up and take something positive out of it. I remember just how difficult some things were for me. The French twist style took me about 20 attempts. For highlights, it probably wasn’t until after graduating that my highlight foils were tight. Also, if I showed you a picture of my Balayage/ombre from school vs now you’d be pleasantly surprised. If you are struggling with certain things now, don’t let it discourage you. I am living proof that practice makes perfect. Well, not actually perfect, but you get the point! Practice and practice and you will see improvement. Also, if I could give a good piece of advice to students still in school it would definitely be to start building yourself up from the get go by promoting yourself on a professional Instagram page and also through Facebook Pages. Post what you’re learning, post before and after pictures of your floor clients. I did that for myself back in school and it payed off. I get about 85% of my clients from Instagram and Facebook. Consistency is key when posting. You want to keep yourself on the map for your followers. So soak everything in, learn as much as you can, be fearless and take on our amazing industry!